Happy Piasso and Rudy Willie are a Navajo couple and silversmithing team. They use fine natural, untreated stones in their work and the pieces are sometimes marked with Happy's hallmark and sometimes with Rudy's. 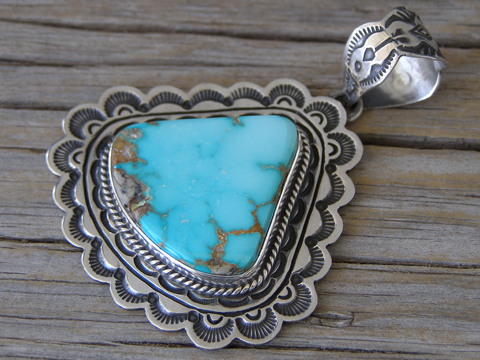 This pendant is set with a superb blue teardrop-shaped stone of natural, untreated Royston turquoise from Nevada. The bezel is wrapped with twist wire and the border sculpted and decorated with stampwork. The bale has a scalloped edge and also decorated with stampwork. We recommend Erma Arviso's 8 mm. diameter Sterling beads to accompany this pendant, though the bale will accommodate beads up to 10 mm. diameter (see below). Hallmarked H Piasso and stamped Sterling on back. Stone: 1 1/16" x 1 1/8"
Dimensions of pendant (excluding bale & jump ring): 1 7/8" x 1 7/8"